Forty years after his hiring at the University of Calgary, Jack Neumann has received the capstone to a legendary career. 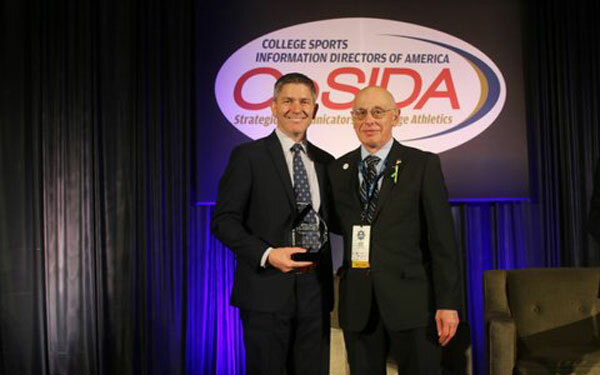 Neumann, who joined UCalgary as the Dinos' sports information director in 1978, received a Lifetime Achievement Award from CoSIDA – the College Sports Information Directors of America – as part of the national organization's convention outside Washington, D.C., Thursday. It's the latest honour for a career that spanned four decades and impacted thousands of students and student-athletes, blazing a trail for Canadians in the American professional organization and advancing the field long before it gained a foothold north of the border. Jack's career and accolades are the stuff of legends, but this one was made more poignant because a record number of more than 40 Canadian sports information and communications staff made the trip to the convention and cheered him on as he stepped on stage. "It's pretty special – I remember coming to these workshops and you could have had the Canadian meeting in one hotel room," Neumann said. "To see so many of my colleagues, even though I'm retired, is pretty special. It shows how far we've grown – I used to be the lone wolf, and now we have more than 40 people here." The recognition is fitting for a man who bleeds Dinos red more than anyone else, to the point where last fall he made a legacy gift to the football program to pay for team jerseys in perpetuity. And, in his trademark style, he brushed aside the recognition, instead focusing on the people who were part of his journey. "The wins and losses run into each other, but it's about the relationships you build over the years," he said, between photo ops with old friends and new. "To see the young athletes come in as boys and girls and leave as young men and women is so special. To see some of the kids of former athletes I worked with now competing for our school shows how old you are, but it means so much. You make a lot of great friends in this business, and I've been blessed to meet so many people." The place, too, was important to Jack: he deferred acceptance of the honour until this year's convention because Washington was the site of his greatest personal achievement in the profession. Jack remains the only Canadian in the more than 60-year history of CoSIDA to have served on the organization's board of directors, and this was the place it happened. "It was in Washington in 1988, after we hosted the Olympics, that I was asked to be on the CoSIDA board. There's significance to that, and it's pretty special to receive this one in Washington." This article was originally published by the University of Calgary.